Get out and talk to your customers. Good knowledge of the “aha moment” will give you direction of development of your product. Instead of doing features that no one needs, you will do elements that are essential. While talking to your customers, the most important principles are to listen and observe, not sell. You should talk like you have no passion for your product in order to get honest feedback. Secondly, remember that actions speak louder than words. 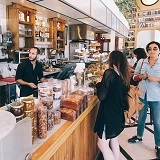 Don’t just collect verbal feedback; observe customers using your product.